Migraine Max™ has 9 active ingredients that are safe and gentle. Feverfew extract, CO Q10, magnesium, butterbur (now PA free), riboflavin, ginger, vitamin B6, bromelain, and pantothenic acid (vitamin B5). 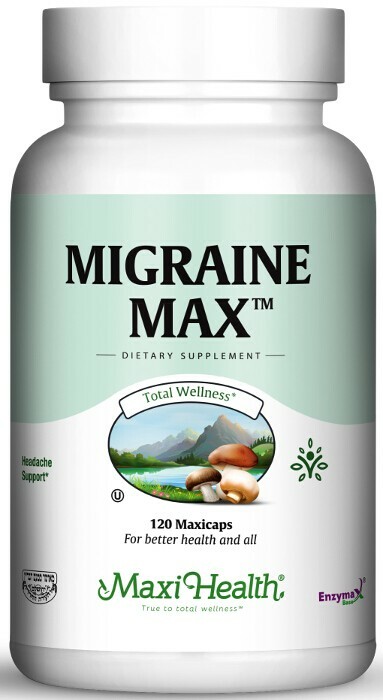 Take Maxi Health Migraine Max ™ for migraine support! Take four (4) Maxicaps™ with meals, or as directed. Other Ingredients: Vegetable cellulose, vegetable stearate, rice flour, Enzymax® (calcium carbonate, bromelain, papain, lipase, amylase, protease, silica), rice flour, maltodextrin, and gum arabic.